The company of Franklin Winfield Woolworth sold discounted general merchandise for five or ten cents a piece and thus helped to coin the term 'five-and-dime stores'. Woolworth was one of the first American retailers which presented goods directly and allowed handling of items without the assistance of a sales clerk. This greatly reduced the number of employees required, dropping costs and thus allowing cheaper products. Woolworth opened his first store 1878 in Utica/New York, but the store failed within a year. However the second store opened on June 21st 1879 in Lancaster/Pennsylvania became a success and soon Woolworth brought his brother Charles Sumner Woolworth into the business, together opening more stores. In 1910 Woolworth commissioned the construction of the Woolworth Building in New York City, the building was completed in 1913 and remained the tallest building in the world until 1930. It also served as the company headquarters until it was sold in 1998 by the Venator Group, the F.W. Woolworth & Co. successor. 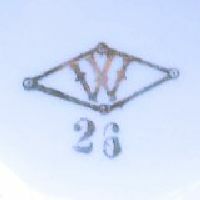 The rhombus mark containing the letter 'W' was a company-dictated marking which foreign suppliers had to use on items made for Woolworth. The gold or blue-colored mark can be found with various country of origin additions. Rumour has it that a red version also exists, but I was unable to track one down so far. Known suppliers included the companies of C. Schumann (Arzberg, Bavaria), the Porzellanfabrik Schirnding (Schirnding, Bavaria) and the factory of Reinhold Schlegelmilch (Tillowitz, Silesia). Early golden rhombus from around 1905 containing the letter 'W' but without any country-of-origin addition. 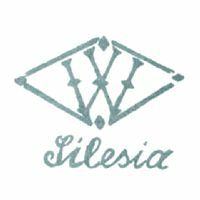 Used between 1930 and 1945, same mark but with 'SILESIA'. Was not only used on items made by Reinhold Schlegelmilch in Tillowitz. 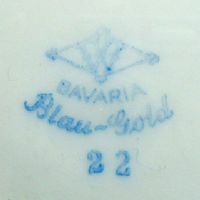 Used around 1950, here above 'BAVARIA' on an item of the 'BLAU-GOLD' series sold by Woolworth in Germany.